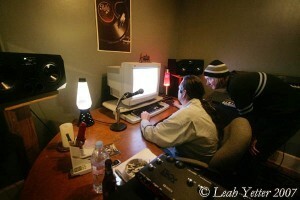 In the past couple of months, Leah and I have had the delight of getting some time in Macon, Georgia’s Trash Monkey Recording Studio. The local Atlanta act, Pop! On Command is currently recording there, and has been kind enough to allow the Concert Sutra girls hanging rights in the Mephisto Tape Sessions! Owner and Proprietor, Russ Kennington offered some time for an interview as well. This last month’s session brought a very special guest down from Atlanta, Vietnam’s Stan Satin. Check out the following interview to hear about our fun with the boys! 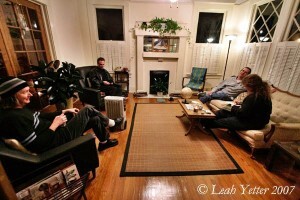 To catch a glimpse of the good times, visit: http://www.leahyetter.com/cstrashmon0107/. Leah is back, and ready to shoot! We are looking forward to a great year with friends and kicking live music!!! Concert Sutra: We came to this house for a reason for the interview. Tell a little bit about your history with this location (that which is now the home of Concert Sutra Photographer, Leah Yetter). Russ: No, not Noel. Noel never moved in. He just lived two blocks away. Concert Sutra: Who or what inspired you to get into music? Russ: As a child, I had a deep love for the guitar, and guitar players were romantic to me. Being from the town that was really hot coming up. Dwayne Allman was a big influence. Jimi Hendrix. Joe Perry. Brian Jones. Just straight out rock players like that pretty much so are what turned me into the person I’ve become today. Concert Sutra: Give me some background on how Trash Monkey came to be. Russ: Trash Monkey came after I got tired of working around the Southeast in clubs and small venues and whatnot. Early “Alternative-style” clubs, and trying to work a day job, and going out three nights a week, and having to work five, and just burning out on that, and kind of deciding I was ready to have children and settle down a little bit more and wanted to do more on the recording end of it. I knew that I never wanted to get out of music completely, but I just felt like it was time for me to spend more time at home. My Wife and I were ready to raise a family and it seemed like the right thing to do to get more involved in the recording end of it, and try to work developing other artists out there that were doing the same thing I was doing…banging their heads against the wall day in, day out, and just get into more recording. Concert Sutra: How did you end up in that building? Russ: The building is a piece of family property. It was formerly a family business, the auto parts retail industry, and that business was sold around 1990. I worked for a while for some other people, but never really was able to accept, I suppose you could say, working for other people after I’d worked for myself or worked with my family all my life. It was kind of hard to adjust to it after so many years. That’s one of the reasons I wanted to get back into the studio business, because I wanted to get back into business for myself. Concert Sutra: Right on. Where did the name come from? Concert Sutra: Lauren and Parker! 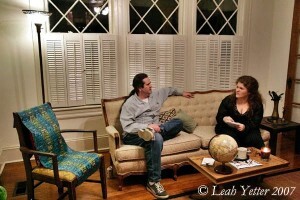 Russ: Lauren and Parker…they were in the kitchen, and this is when I had officially become a stay-at-home Dad. They were about two years old. And, they were playing in the trash can in the utility room right off of the kitchen, and I said, “hey, get outta there, you little trash monkeys!” (laughs) It just kind of stuck. From that point on…for about the last five and a half years or so, the name was changed to Trash Monkey Recording Studio. Concert Sutra: Tell me about your process, and what equipment you use when you’re recording. Concert Sutra: Which we will talk about in just a moment! Russ: just trying to maintain quality components that convert the signals over, and the mic preamps and whatnot to go to the various instruments that are being recorded. Then, I’ve got a complete array of vintage equipment, especially guitar equipment…which is…I’m a guitarist by trade, so I’ve got about thirty odd guitars and six or seven amps right now that we use. Concert Sutra: What kind of software do you use? Russ: Software…I use Digital Performer, which is a Mac based program. It’s solely on the Mac OS platform, and that’s what I’ve been working with for almost nine years now. Prior to that, I used tape-based machines, but tape is very expensive to obtain now. It’s extremely expensive to maintain the machines. The outcome, you just can’t charge what you can charge with digital based studios. It’s too expensive. Sadly enough it’s gotten to that, because tape is certainly a much better medium to work with, but it’s hard for a client to come in and pay a couple of hundred dollars an hour, or a daily rate of a couple thousand dollars if they’re bringing their own people in when you’re using a two inch tape based shop. That’s really what you have to charge to get by. Concert Sutra: How do you get into the “mode” for getting ready to record? Russ: Usually, like I said, when I’ve gone through the interview process with the client. I’m always gonna meet with them or have an extended phone conversation, or email exchanges or whatnot. I’m gonna find out a lot of times what they’re like. They might have a little home demo that they’ve done themselves, where I can get an idea for what they’re doing, then what I like to do is usually, on my way to the studio, which is about a thirty minute ride from my home…I will put in something that’s gonna be similar to what I’m expecting them to sound like, compared to what they’ve told me, or what we’ve talked about, or possibly even heard from their own home recordings, and get into the mode of listening to things like that and maybe a couple days up to it, try to listen to people…other producers…mix engineers that work in that same genre of music, and kind of see how they would treat things if they were put in my shoes for the situation we’re in with bands that are working on mainly a pretty fine line of time constraints and money, and make sure that I’m prepared, I’ve got my shop set up, and I’m ready to go ahead and record a band. Basically, it’s just a matter of trying to listen to some music in that genre on the way to the studio, and really kind of focus in on that. Like I said, maybe go back and think about what other engineers and producers have already worked on and liked, and how they would handle it. Concert Sutra: Tell me about your most recent project. 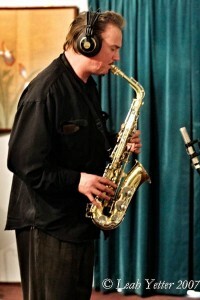 Russ: that did an incredible amount of Sax work on it. Worked very hard with him. Lee Anderson, session player from Nashville on guitar coming in. Had some session drummers come in from Tampa, from just all over working on, and that’s in the process of being mastered and duplicated as we speak for distribution. Concert Sutra: What about you, as a musician? Russ: Well, as a musician, I still do my side project, Valentine Fix, and I don’t have as much time as I’d like to do that, because I’m staying pretty busy with the studio working with people. Since I’m pretty much a stay at home Dad during the day as well, that gives me the obligation of looking after the four children, but as a musician, I still do sessions with a lot of clients. 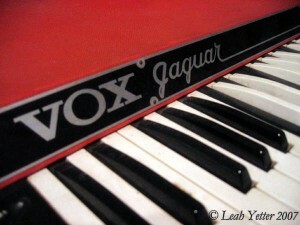 Not only on guitar, but I do play bass, and do a lot of keyboard work. As a matter of fact, on Kenny’s record, I played all the organ on it, and did some electric piano work on it, and some guitar work on his project as well. Concert Sutra: Are there any other bands you are working with and recording these days that you are excited about? Russ: Yes, right now, my big big thing that I’m working on, and I’ve got three record projects going on, but it would be Pop! On Command, and that’s a band that I have a lot of vested time and interest in, and it’s probably my best friend, little brother, all around good guy, Noel Page, and we’ve been working on this thing and trying to put it together for a good while, and I’ve finally gotten him to come into the studio and start working on it. We’re having great success with that. He’s had Stan Satin (of the legendary Athens, Georgia band, Vietnam) come in and guest for him on sax, and I will probably be playing something on it somewhere along the line. I’m not sure yet, til we get to that point, but right now that would probably be my number one priority. I’m working with another solo artist by the name of Roger Hill, who is very…he’s kind of a cross between maybe like Bob Dylan and Wilco. Very folksy, with a little R.E.M. thrown in. He’s basically doing everything himself on his record. We’re currently in the stage of tracking drums…we’ve been working on for the last few weeks, and he is really a very interesting performer to say the least. He’s an incredible songwriter and musician, but especially songwriter. Very talented. I’ve got another project, a hip-hop project that I’m working on right now. A record by a gentleman by the name of Dexter. We’re working on all of those, and in February I’ve got a record project starting out with a band called Gertrude’s Mojo (giggles in the room). I’m trying to kind of stay away from the smaller demo projects right now. I keep my focus on all the Indie record stuff that we’re working on right now. Russ: Not at all. A serious musician is a serious musician. If they’re serious, they’re gonna come to the studio prepared, well-versed, and ready to get their work done. Then, you have the rest of the people out there. There are a lot of great bands out there that don’t come in prepared and don’t necessarily know how to handle themselves when hey come in, but we still manage to get some good product out. Generally, I don’t think that there’s a lot of difference from genre to genre, because if you’re motivated and ready to come into the studio and record, you come in and you do the best that you can. Concert Sutra: The first time I ever saw you and Noel (now Pop! On Command) was in Valentine Fix, as you mentioned. It was a Halloween party at the Highland Terrace house in 1992. My first year in Macon. Do you think that Valentine Fix will record again? Russ: As me, with my guests, it will. I am working on my songs now, as I have the time to do it. There will probably never be any one incarnation of it, and I don’t know whether or not we’ll ever play out again. I’ll definitely be working on my record until the day I die…records…whatever the case may be. It’s just that I try to put my clients first, and schedule around them, so that limits my time on what I can do. Concert Sutra: Do you have a favorite band or musician right now? Russ: I don’t know if I have any one favorite band, you know. I guess that if I had to say anybody…The Dandy Warhols have been probably my most respected band for many years now, since I saw them I guess in ’99 I believe it was. Either 1998 or 1999, when I saw them open for Love and Rockets, and I had never heard of them. I thought whose this pretentious band giving themselves the name The Dandy Warhols? Me, along with about six or seven other people stood in front of them on the main stage at the Masquerade, and were completely blown away. It went from “they’re really not that bad” to “hey, they’re pretty good” to “are you kidding me, these guys are blowing me away!” Having been able to sit down and meet them, and have the pleasure to make their company…they’ve played Atlanta several times, and them being very generous to my oldest son on his last birthday, when he got to see them on his birthday, and Peter was nice enough to come back after the show and spend a lot of time with Christian. Concert Sutra: (Leah and terri) AAAWWWWWWW!!!!!! Russ: I just have a lot of respect for those guys and having gotten to know them a little bit, I would have to probably say that they would be at the top of my list. I listen to so many different things, you know, I may be listening to Coltrane one minute, and ZZ Top the next. My musical pallet runs over a broad spectrum. Noel: Did you hear the Dandy Warhols’ Gang of Four remix? Stan Satin: Where are the Dandy Warhols from? Concert Sutra: I love Portland! Russ: They’re really nice people! They’re just plain nice people. Noel: Dandy Warhols or Brian Jonestown Massacre? Noel: OH!!! Votin’ for the Dandys! Concert Sutra: (to Noel) They’re his favorite! Top of his list, anyway. (to Russ) What can you offer as far as equipment, instruments, and resources that you can offer to warrant the drive for out of town bands to come here and record at Trash Monkey Studio, and for locals to choose Trash Monkey Studio as their recording studio? Russ: I’ve got an arsenal of about 30 plus guitars and basses, mandolins, Moroccan lutes, a lot of ethnic stringed instruments, and things like that that are very interesting. What I really pride myself in is the fact that I really try to keep the best quality recording equipment that is obtainable in the studio, and I have a collection of mics to die for. I’ve got nothing but the absolute top quality equipment in the studio, which I feel, along with my experience with working with so many different groups over the years is going to be my strongest point. If people have the chance to come in and look around and see what I have, or they can check out my myspace page at www.myspace.com/trashmonkeystudio. They can get an idea of what they would have in store for them in the fact that I’ve got a place that’s in downtown Macon a half a block away from the historic Capricorn recording studio. I’m not working out of my bedroom or my garage or my basement. I’ve got a professionally treated studio with an incredible vocal booth with hardwood walls in it. Concert Sutra: What he said! (laughs) How do you juggle the responsibility of a Wife, four kids, Miles, Christian, Lauren and Parker, two animals, Nalla and Lulu, and a household with the long hours required to make good product? Russ: That’s a good question. I don’t know! I guess you just gotta kind of get into a groove. You do what you have to do. It just becomes a routine process that you become used to. I know that I get up at a certain time every day, and I get my children to school. I do my things that I need to do at home while they’re in school, or if it’s summer, we’re hanging out by the pool. Whatever we’re doing, it’s just something that you automatically work yourself into. I have days off here and there. It’s not like I record every day of my life. It’s usually about three or four days a week that I’m working at the studio. The rest of it, I try to give it all to the family. Concert Sutra: With a very nice abode, to boot! Who did you grow up listening to? Russ: When I first started listening to music, when I was five, I bought Meet the Beatles. That was the first record I ever had, and completely fell in love with rock and roll music as we know it today. From there, I went on to Jimi Hendricks, and when I heard “All Along the Watchtower” I got into Bob Dylan. Leah: (in a very throaty, deep voice) Yeah! Russ: And then, as a young teenager in the hotbed of the Capricorn community, the Allman Brothers really seduced me. Then, it became more rocky things like early Aerosmith. Even from things like that took me back to music like Velvet Underground. It’s funny how from band to band you can go back and forth in time, and you find out what great musicians these people were. Truly, I don’t know if people today can realize how fantastic what we have recorded a lot of it actually means as just a society, and what it’s done to change it. Concert Sutra: Living or dead, who would you want to get into your recording studio? Russ: Jimi Hendricks. Hands down! Russ: There would never be a question of that! Concert Sutra: Stan, I have a couple of questions for you, actually, if you don’t mind. 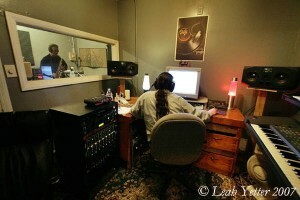 Concert Sutra: How was your experience in Macon as an out of towner coming down to record at Trash Monkey Studio? Noel: (excited) You saw Bibb Music?? Stan: Yeah! I went in and talked to the guy! Noel: Well, you did good for yourself! Stan: I asked him about Trash Monkey Studio, and he said “I think I’ve got one of their posters” or something up, and we went in and looked for it, but he said someone must have taken it. Noel: I took lessons from Budlow, didn’t you? Russ: Budlow Allen. One of the greatest guitar players to ever face the Earth! Noel: He’s amazing. True story! He turned down a stint to be on the Johnny Carson Show, he was gonna be in the Johnny Carson Late Night Bad, but he didn’t want to leave Macon. Russ: That’s a true story! 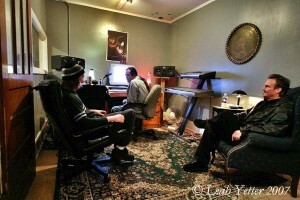 I had the privilege of recording Budlow in my studio a couple of years ago for EG Kite last record project. Noel: He’s cool. Roger Budlow Allen. Noel: Does he still work there, Russ? Russ: He works part-time. He only works in the summer. Concert Sutra: You used the bathrooms at the Rookery, and I know there is A LOT of history in those bathrooms!!! Stan: Good! I didn’t know that when I was in there. Russ: Opposite bad ends of town! Stan: I do find it odd that there is no Main Street right downtown in the center of the City! Concert Sutra: (to Noel) Noel, as someone who has worked with Russ for so long, what is your perspective of Trash Monkey Studio and the things to come? Stan: Then, were YOU ready? Noel: Probably not. Nothing but the ultimate love and respect for my brother Russ. This is a monumental day for me. I’m very happy. Concert Sutra: We almost got Stan killed! Concert Sutra: Well, we’re glad you made it alive and well finally! Noel: I can’t imagine how he could prefer Varsity over Nu-Way, though. Stan: I guess cause I’m an Atlanta boy, and that’s what I’m used to. Russ: Well, guys, the next time…I’m sure there will be a next time…we’ll have to take you to Fincher’s BBQ. Concert Sutra: And we can go to Grant’s Bakery next door to get a Pac Man cookie!! Russ: Actually, Fincher’s has been to the moon and back! Noel: (cracking up) That’s right! Russ: One of the astronauts took it in space with him when he went on his moon mission! Sonny Carter! He was from Warner Robins. Noel: I was born on the Air Force Base!! Stan: You can’t say BBQ without me wanting to try it! Concert Sutra: Well, it has been a pleasure hanging out and talking with you guys. Thanks, everybody! And to Leah for opening her home for our purposes!